Michael Sailstorfer (b. 1979, Germany) is one of the most important representatives of a young generation of German conceptual and installation artists. With his inexhaustible wealth of ideas he manages to continually update the definition of sculpture and to locate this in socially relevant contexts. 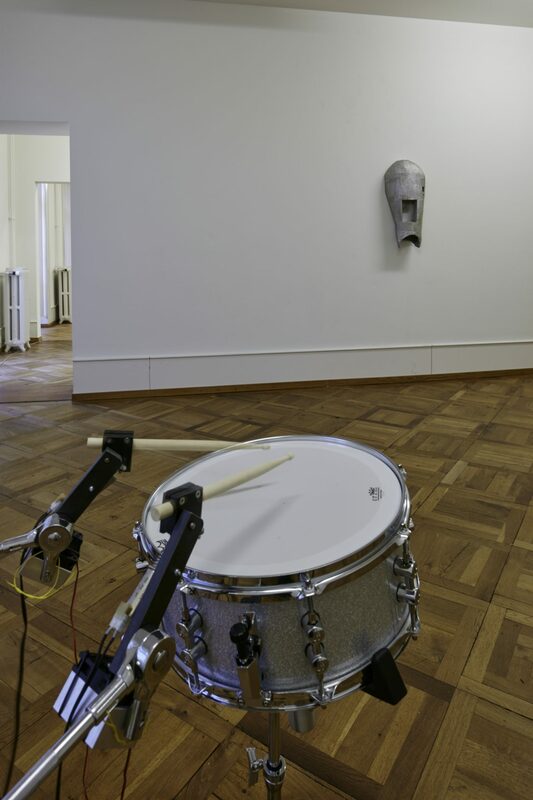 Characteristic of his practice is the translation of everyday artefacts in works which draw attention to the connections between sound and materiality, metaphysics and physicality. At Kunsthaus CentrePasquArt the internationally known artist is presenting his first institutional exhibition in Switzerland. 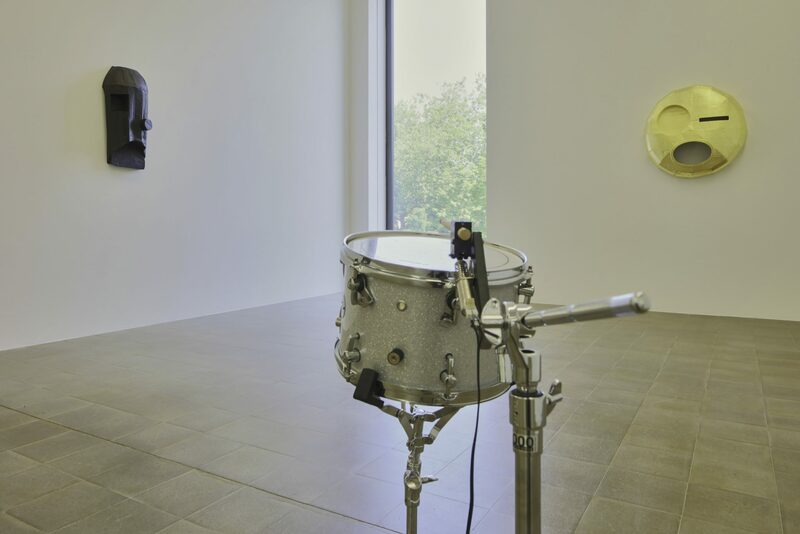 The acoustic and sculptural leitmotifs of the exhibition are created by a drum kit which, taken apart as individual instruments, is distributed throughout the spaces. The sounds of a drum solo are reproduced synchronically on each of these drum instruments. 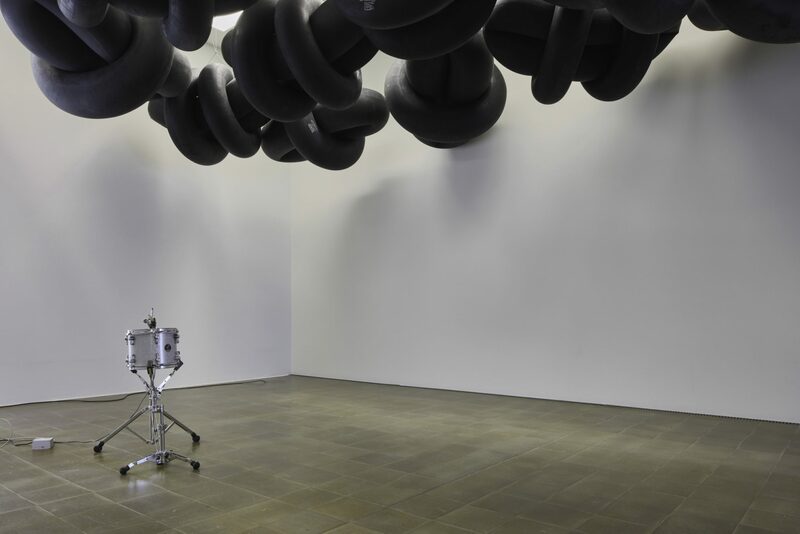 In addition to this sound installation, whose rhythm accompanies visitors through the spaces, are a series of archaic looking masks, large-scale installations made of tubes from lorry tyres and a film. The exhibition complex becomes a physical experience and refers to the potential for the things that surround us in life to acquire new meaning. 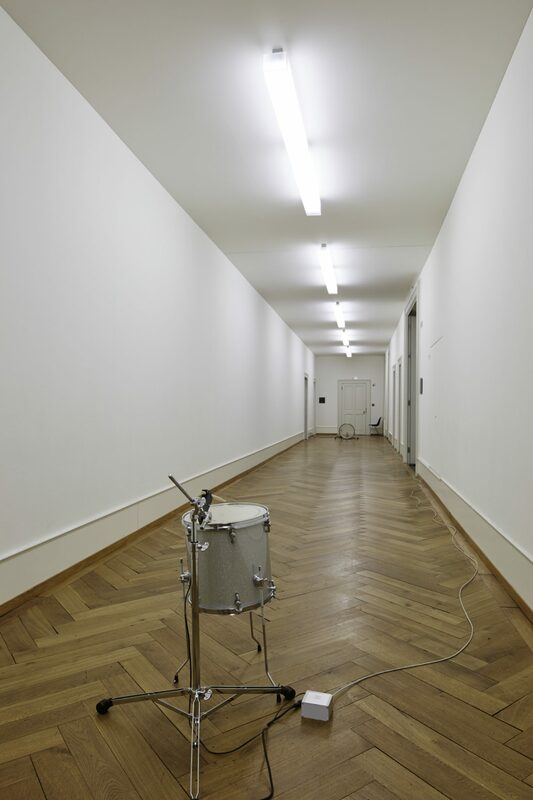 For the site-specific work D.A.V.E.L.O.M.B.A.R.D.O., 2015 the individual drum components, such as the hi-hat, the cymbals or the tom-toms, are distributed throughout the spaces of the Galeries, Parkett 1 and the staircase. On the fragmented drumkit each individual sound of a drum solo is reproduced simultaneously by means of technical equipment. Michael Sailstorfer has borrowed the piece from the American drummer Dave Lombardo. The musician with Cuban roots became known as the founding member of the genre-forming thrash-metal band Slayer. Formed in 1981, the group is considered to be one of the most influential metal bands. Their style was characterised by diverse ways of playing, rhythmic guitar riffs and a provokative image that engaged with occult symbols. 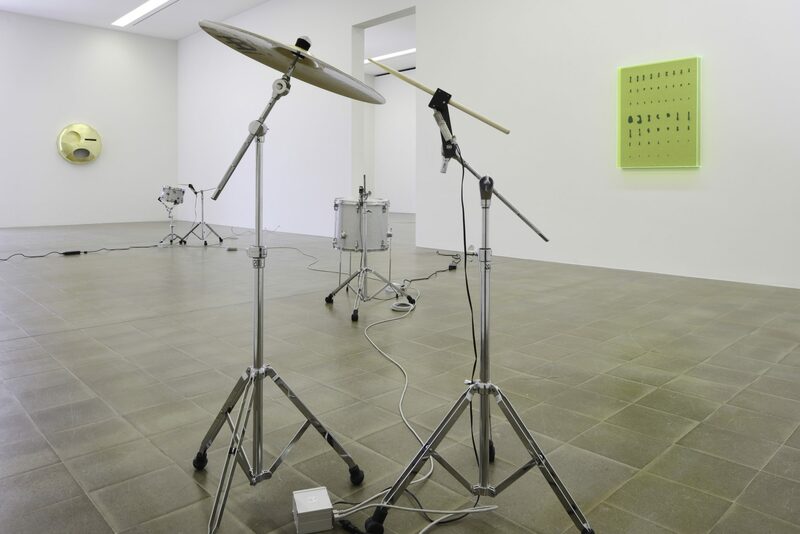 The fragmentation of the drumkit – the breaking up of a symbiotic unity – results in the impossibility of hearing the piece of music as a unity. It is only in walking through the exhibition and through the intermittent superimposition of the layers of sound that the visitors can imagine the piece. 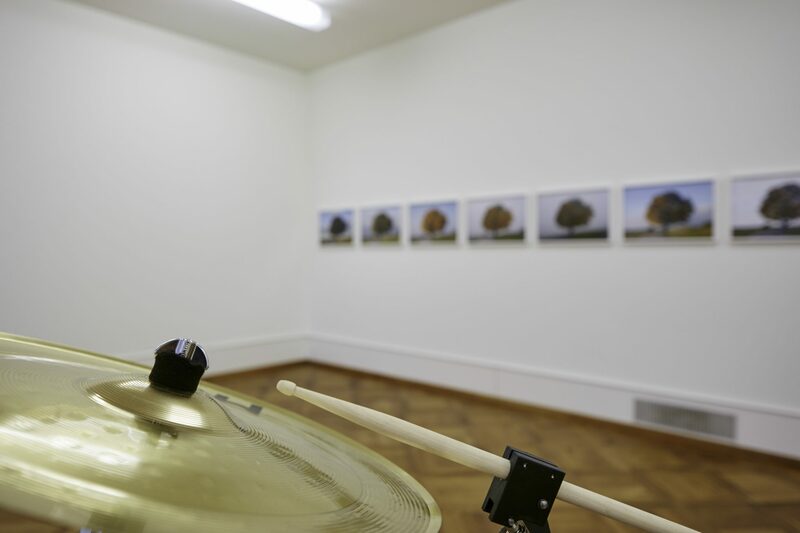 The deconstruction of the drumkit and the solo produce shifts in meaning and rearrangement, in which the visitor is placed in the role of accomplice, thus becoming a part of the work. The masks made of aluminium, bronze or iron, all produced in 2015, are characterised by reduced stylistic features. Because of their primitive seeming expression they recall on the one hand the cult masks of primitive people. On the other hand, the objects reveal the process of their contemporary production. The cardboard models are cast in a sand casting process and subsequently in the relevant metal. Sailstorfer’s sculptures play with the symbolism of the earliest masks, such as the exorcism of spirits, protection from demons or the ancestor cult. However, they also reflect a post-apocalyptic aesthetic as the masks resemble robots which could have been made from re-cycled metal. A layering of a synthetic physicality and an archaic seeming symbolism is created. The installation Wolken, Biel, 2015 takes as its starting point the natural element of clouds, interpreted by means of industrially produced lorry tubes. The large-scale installation occupies two spaces in Parkett 1 and the Galeries. The work calls in equal measure on the imagination of the visitors as well as on the idea that all objects, alongside their practical function, can also take on other appearances. The installation demonstrates that the transition from everyday objects to new states is critical for Sailstorfer’s practice. Through simple interventions the artefacts acquire alternative meanings and fixed world views can thus be re-thought. The work Solarkatze, 2012 shows a stuffed cat placed on a tall plinth, staring, as though hypnotised, into a lightsource hanging above her. The cat sits calmly and motionless on her throne above the eyes of the public. The grandeur of the classical statue is undermined with subtlety and humour. A work which can be walked over, Teppich, 2013 is made from police uniforms and questions structures of hierarchy and the public perception of persons who carry out state functions. For the work Hand und Fuss, 2014 the artist reproduced in rubber all 53 bones to be found in a hand and a foot and arranged them according to size. The basis for the 16mm film Lohma, 2008 is the explosion of a building made of corrugated metal. This process was captured with a high speed film camera. The film creates the impression that the house is breathing as it can be seen repeatedly how the house stretches until it reaches a certain volume and, shortly before it explodes, contracts again. The twelve-part photographic series Antiherbst, 2012 documents an action which reproduces the transformation of a tree on the banks of the Rhein north of the Walsum lift bridge. When the first leaves were falling in early autumn, Sailstorfer gathered them, painted them with green varnish and attached them back on to the tree. In this way an artificial tree was created which seemed to defy the unstoppable course of nature though autumn and then winter. The character of Michael Sailstorfer’s exhibition can be read as a body constructed from works in various media. Sailstorfer questions not only our usual understanding of sculpture but at the same time dissolves the barriers between individual works. 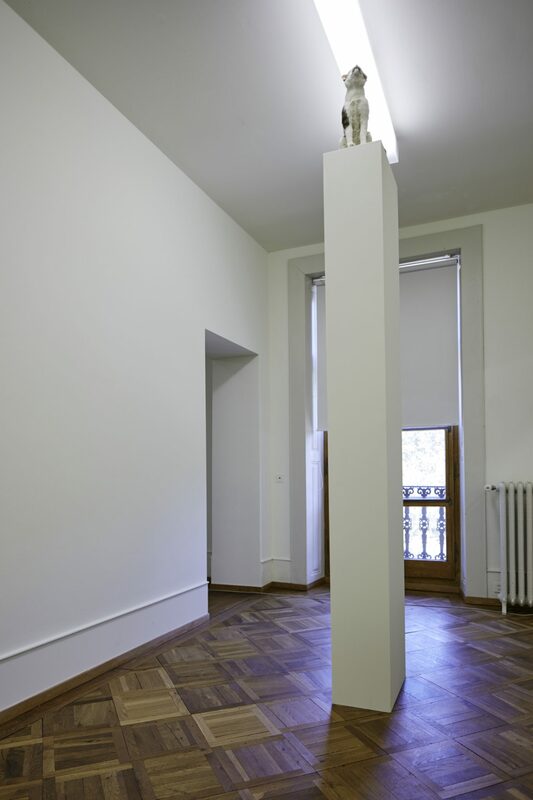 A discrepancy becomes visible since the works appear on the one hand as self-sufficient and self-determining and, on the other, relinquish their claim to autonomy in the exhibition. At a time in which world views are becoming ideologically cemented and political fronts are hardening, the artist allows us a glimpse into a universe in which models of perception can be playfully deconstructed and preconceived world views begin to falter.